Electric bicycles are here to stay. More and more people are seeking substitutions for riding the bus and train. In addition, the global commitment to combatting climate change means that people are seeking ways to protect the environment. Part of protecting the environment means avoiding gas and diesel-powered vehicles. And with governments continued investment in biking infrastructure, the demand for electric bikes is only going to continue to rise. Many years ago I visited Amsterdam and Germany. I didn’t stay long in Amsterdam, but, aside from the redlight district, there are three things I clearly remember. The first is that many people ride the trains as contrasted with people who drive cars in the US. The second is that there were tens of thousands of bicycles parked and layed up outside of the train station. And the third is that people living in apartment buildings bring their heavy furniture up outside the buildings and in through the window, rather than inside through inside elevators. This second observation illustrates something about the Netherlands. People there love their bicycles. And Amsterdam probably has the largest percentage of cyclists of any major city in the world. E-bikes are becoming more affordable. Increases in technology are leading to new designs with much better batteries. The increase in battery life means that electric bicycles of today can go for longer distances on a single charge. Bike riding is a great way to tone back muscles. Bike riding is also a good, low-impact cardiovascular workout. In Europe, three good examples of countries experiencing an increase in e-bike usage are the Netherlands, Spain and the United Kingdom. Many European cities are putting a fresh focus on cycling to reduce congestion and pollution levels. Municipalities have been taking advantage of new town planning technologies to design more municipal options for cyclists. This expansion in support for cyclists is accompanied by a significantly increased investment by the public in alternatives to traditional bicycles. Contrary to what you might have expected, citizens in places with an established love for traditional bicycles have been willing to explore ebikes. In Holland, electric bicycles saw a huge 24% increase in sales from 2014 to 2015. Even more astounding than that percentage increase is the fact that a total of 276,000 electric bicycles were sold there in a twelve-month period. In the UK and Spain, the rise of electric bicycles is even more startling. Between2014 and 2015, electric bicycle sales increased 40 percent in Spain. While in the UK, the government started off the year 2017 with a multimillion pound investment in cycling. Electric bicycles have the potential to be the great alternative to motor vehicles. Their selling price is much more affordable. And electric bicycles don’t damage the environment because they are rechargeable. The motors vary in power depending on how you want to use the ebike. For example, you can buy an ebike with a motor of 100 watts or you can buy one with a motor of 600 watts or somewhere in between. If you live in a mountainous or hilly area like San Francisco and you just want to use the power to help you through some of the steep hills, then you may opt for a lower power bike. On the other hand, if you don’t want to do all of the peddling that you would do on a regular bike, then you might opt for an electric bicycle with more watts in the motor. Related questions worthy of further exploration are the type of motor you may want in your ebike or the type and size of the batters. Electric bicycles are motorized bicycles using electric motors. More precisely, an electric bike is a bicycle along with a motor attached to the pedals and powered by a battery. There are several variations of electric bicycles available. These variations include those electric bikes which add a kit (containing the motor and battery) to a normal bicycle or to a custom built one. For those looking to save money during the energy and economic crisis we are facing, electric bicycles might be the ideal solution. 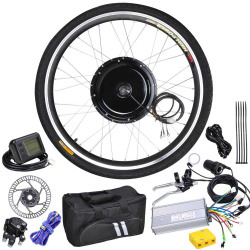 An Electric Bike Conversion kit ranges in price from $400 to $800. The custom built ones range in price from $400 to $3,500. 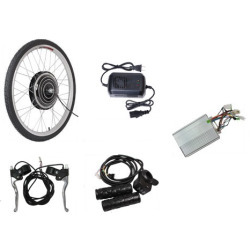 If you’re looking for an electric bike conversion kit, you can find an entire selection of electric bike conversion kits here as well. When compared to the cost of operating an automobile, these electric bicycles can be a real bargain. Riding an electric bike 500 miles can save around 25 gallons of gasoline. This can save the environment and the pocketbook. If you want to find out more about electric bikes, their features, and the various pricing options available, you can find a full selection of electric bikes for adults here at Bicycle Shop Online. As an alternative, Amazon also has a full selection of electric bicycles which you can review here. Contrary to what you might think, the concept of a motorized bicycle is not new. As far back as the 1890s, electric bicycles were patented in the U.S. For example, on 31 December 1895, Ogden Bolton Jr. was granted U.S. Patent 552,271 for a battery-powered bicycle with “6-pole brush-and-commutator direct current (DC) hub motor mounted in the rear wheel.” There were no gears and the motor could draw up to 100 amperes (A) from a 10-volt battery. The California Motor Company, which was founded in 1901 to sell gasoline-engine motorbikes in Oakland, and San Jose, and San Francisco, began with 1.5-horsepower engine mounted to a standard bicycle frame. That bike, the California, could reach speeds of 25 mph. However, it weighed 75-80 pounds. During the summer of 1903, George A. Wyman rode a 200 cc, 1.5-horsepower California from San Francisco to New York City, becoming the first person to cross the North American continent aboard a motor vehicle. Motorized bicycles using electric motors have recently re-entered the market in a big way. Electrically powered bicycles use batteries, which have a limited capacity and thus a limited range, particularly when large amounts of power are utilized. This is different from a motorized bicycle with an internal combustion engine. The design limitation of the electric bike means that the use of the electric motor as an assist to pedal propulsion is more emphasized than is the case with an internal combustion engine. More expensive, new types of batteries, especially lithium batteries, along with electronic controls have enhanced the power and range while reducing the overall weight of the bicycle. These advances in technology have led to newer electric motor bicycle designs gaining increasing acceptance. This is especially true in countries where increasing traffic congestion, aging populations, and concern for the environment have stimulated development and usage. Advances in technology have led to many models of ebikes being available on the market today. However, keep in mind that an electric bicycle is not the same thing as an electric motorcycle. Also, as mentioned earlier, these ebikes should not be confused with gas powered bicycles and bike conversion kits which will allow you to add a gas motor to your regular bicycle. Why Use an Electric Bicycle? The summer heat can take the starch from any enthusiastic cyclist and hills and long distances can be rough on even the most seasoned of cyclists. An electric bicycle can take some of the pain from exercising or running errands by helping the rider get to a destination fresh and stress-free. A commute to the job can be stressful in a car when dealing along with traffic jams; however, breezing by the traffic on an electric bike or e-bike can aid the commuter into getting to the job on time and without the sweat of pedaling the whole time. Time can likewise be saved looking for a parking space at the destination. Simply lock the bike and get to work. Most electric bikes are equipped to function without any pedaling needed. However, the cyclist can save battery power for longer distances by only engaging the motor when required, such as uphill or when energy levels wane. By law, the maximum speed is 20 miles per hour and the standard maximum range is between 10 to 40 miles depending on the terrain, the weight of the cyclist and the climate. Most motors run silently and all electric motors are environment-friendly and require fairly little power to recharge the battery. Small, lightweight trailers can be added for larger parcels and groceries or pouches and baskets can be installed on the frame for smaller packages. Electric bikes can give exercise as well as guidance clean the air. Several people have actually turned to the e-bike all over the globe and depend on them for transportation. They do not require a state license plate, and the operator does not need a license or insurance to ride them on public streets. The cyclist should obey the same traffic laws as motorists and motorists are needed by law to respect the cyclist in the same manner. The road is a safe place for the law-abiding cyclist. The electric bicycle is a perfect alternative to an automobile or motorcycle. A two- or three-wheeled vehicle with fully operable pedals and an electric motor of less than 750 watts (1 horsepower), whose maximum speed on a paved level surface, when powered solely by such a motor while ridden by an operator who weighs 170 pounds, is less than 20 mph (15 U.S.C. 2085(b)). At the present time, neither the DOT nor the NHTSA restricts the assembly of e-bikes for use on public roads, although commercially manufactured e-bikes capable of speeds greater than 20 mph are considered motor vehicles and thus subject to DOT and NHTSA safety requirements. Consequently, the laws of the individual state and/or local jurisdiction govern the type, motor wattage, and speed capability of e-bikes used on public roadways (see Electric bicycle laws). As long as the bicycle is capable of pedal propulsion, most U.S. states currently do not currently offer a separate distinction between designs that are self-propelled by an electric motor as compared with pedal assist designs in which the electric motor assists pedal propulsion by the rider. “Gas Motors on Bicycles – At Last, Final Answer | Florida Bicycle Law”. n.p., 1 Jan. 1970.Web. 26 Nov. 2016. “Motorized bicycle ” Wikipedia. n.p., 1 Jan. 1970.Web. 26 Nov. 2016.